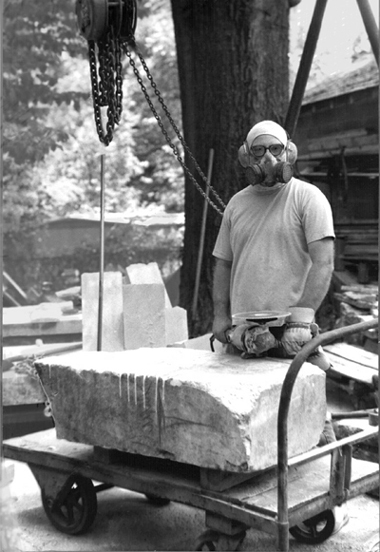 Taking a break while dressed-up for dust during the rough-cutting of a 650lb-block of georgia cherokee marble. Making sculpture in stone means making a lot of dust, and the right safety gear is important. At the end of a session of carving I usually am completely covered in white dust, so whenever the weather permits I make that dust out-of-doors. Everything in my studio looks rather ghostly because it is covered in a layer of dust, even though I do clean up on a regular basis with a blower and a vacuum. The workpieces and tools I have recently moved are usually only lightly dusted, while on the equipment or storage shelves it is usually more than a quarter of an inch deep. I also use an exhaust fan when working inside, but that only removes a portion of the dust I make. A good organic vapor-cartridge respirator is a necessity, whether working indoors or out.